Remember that time when everyone was crazily excited about the concept of open-source software? Suprise! Nobody cares about open-source now (except geeks and all-mighty developers, naturally). Nearly every piece of traditional software -- either licensed or open-source -- is getting gradually pushed out of the market by its SaaS alternatives. One of such invaders called to bring “The SaaS Apocalypse” even closer is xt:Commerce NEXT -- a new, promising hosted e-Commerce solution by xt:Commerce. While a vanilla open-source version can be fairly criticized for a set of minor drawbacks, xt:Commerce NEXT is a perfect example of a well-balanced, functional shopping cart with users in mind. Powerful and beautiful, NEXT has a large selection of pre-made customizable themes, outstanding marketing & SEO features and offers a worthwhile mobile experience to both administrators and customers. Already love it? We too! 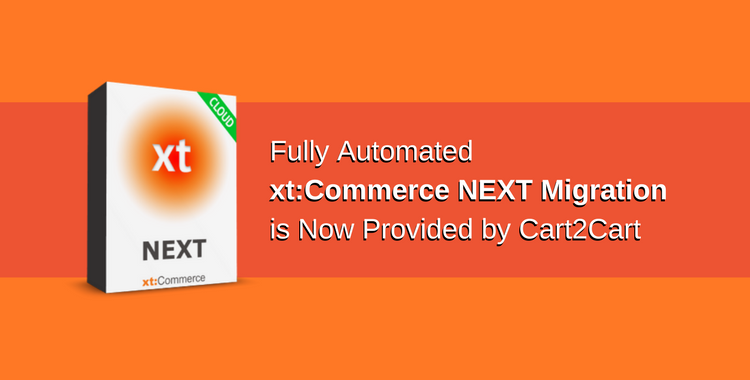 That’s why Cart2Cart is happy to introduce the support of automated migration to xt:Commerce NEXT -- here, now and forever! Not sure about xt:Commerce NEXT or Cart2Cart? Give both a try by using FREE Demos! Create trial xt:Commerce NEXT store for 15 days and perform Demo data migration to transfer a limited number of data from your current store or CSV within 30 mins!